The Destruction of Hillary Clinton is an answer to the question many have been asking: How did an extraordinarily well-qualified, experienced, and admired candidate—whose victory would have been as historic as Barack Obama’s—come to be seen as a tool of the establishment, a chronic liar, and a talentless politician? 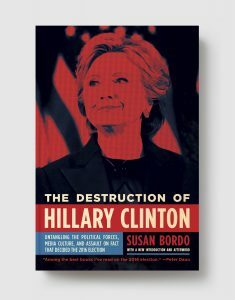 In this masterful narrative of the 2016 campaign year and the events that led up to it, Susan Bordo unpacks the Right’s assault on Clinton and her reputation, the way the Left provoked suspicion and indifference among young voters, the inescapable presence of James Comey, questions about Russian influence, and the media’s malpractice in covering the candidate. Updated with a new introduction and afterword for the paperback edition, The Destruction of Hillary Clinton is an essential guide to understanding the most controversial presidential election in American history. SUSAN BORDO is a media critic, cultural historian, and feminist scholar. Her books include Unbearable Weight, and, most recently, The Creation of Anne Boleyn. She is Professor of Gender and Women’s Studies at the University of Kentucky. Read her on MobyLives!